The sprawling region of Patagonia, split between Chile and Argentina by the Andes Mountains, encompasses multiple national parks and claims an epic number of mountains, lakes, valleys, rivers, and animal species. Because of the region’s natural beauty, the number of things to do in Patagonia are vast and vary greatly. Patagonia is an intrepid explorer’s paradise with endless options for trekking, hiking, biking, horseback riding, kayaking, and boat trips. As the gateway to Southern Chilean Patagonia, Punta Arenas is primely located in proximity to all the region’s attractions. While this bustling town is a great place to set up shop for the majority of your Chilean Patagonian trip, it’s also got many appealing aspects of its own. Wander around the historic Plaza Munoz Gamero and admire the 19th and 20th century style houses. Get picture-perfect views of the Strait of Magellan and Tierra del Fuego from Mirador Cerro La Cruz, a viewpoint located just a short walk from the main square. Visitors can also spend the day wandering around and admiring the historic sites and monuments like the Lord Lonsdale Shipwreck and the Contanera del Estrecho. 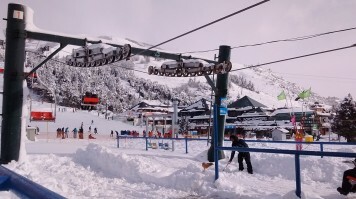 Good to know: If you want to get out of town for a day, hit the slopes at Club Andino Skiing, just 8km away. 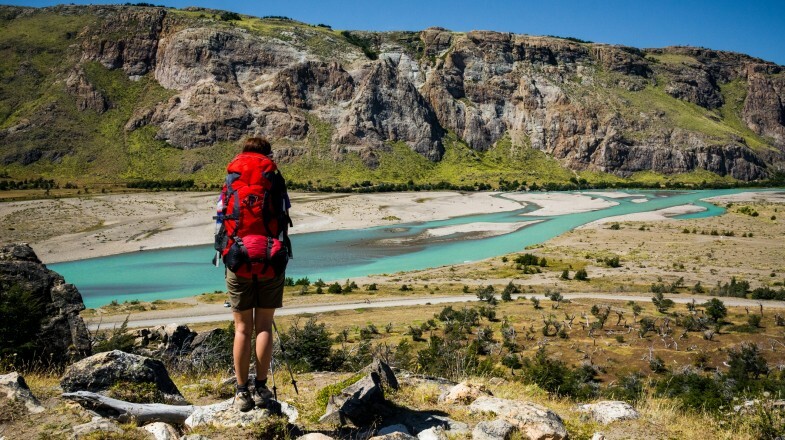 Offering roughly 60 kilometers of breathtaking terrain, the W trek hits most of the highlights of Torres del Paine National Park and is considered one of the top things to do in Patagonia. Over the course of 5 days, trekkers will gaze upon several spectacular glaciers, the most known being Glacier Grey, find tranquility in the stillness of the glacier lakes and sweeping valleys and trek to a stunning viewpoint to see the iconic Towers (Los Torres) after which the park is named. Good to know: Make reservations for campsites and refugios well in advance (between 6 – 12 months). Accommodations inside the park is always in high demand. Check out our W trek tours. Located in the most southern part of Chilean Patagonia, Isla Magdalena is a one stop shop for penguin viewing. Over 120,000 Magellanic penguins flock to this island and visitors can view them by following a trekking trail around the island. The penguins are known to be friendly and curious and most visitors are delighted by the intimate interactions, close-up views and surplus of photo-ops. Good to know: This island is accessible from Punta Arenas via a 1.5-hour boat ride. A round trip ticket costs around USD 70*. The pristineness of this region captivated explorers for years. Everyone from Charles Darwin to the Portuguese pioneer, Ferdinand Magellan, perused the treacherous waters around the famous archipelago. Nowadays, this area is best known for trekking and fishing. Explore the capital, Porvenir, once flush with Europeans during the 1800s goldrush, this town now boasts an eclectic blend of culture and ethnicity. If fishing is your thing, visit Lago Blanco, a renowned fishing spot in the area. Also check out Puerto Williams, the most southern town in the world. Here you can feast on a variety of world fusion dishes and learn about the ancient inhabitants of the region at several of its small museums. Good to know: Book a boat to explore Cape Horn, the infamous dark cliffs sitting ominously off the coast of Tierra del Fuego. Although you’ll likely experience strong winds and rough seas, the trip is worth it. Some previous visitors described rounding these cliffs as a near-spiritual experience. The waters in the Strait are known for being some of the most dangerous in the world. Fling yourself back in time to when Ferdinand Magellan first discovered this region by setting sail through the complex network of channels, fjords, and islets. Boat trips vary, but travelers can visit penguin colonies, take off on sea kayak excursions, admire the dozens of historic lighthouses and gawk at the dominating landscape around them. Good to know: Most boat tours leave from Puntas Arenas, a main hub and tourist town in Chilean Patagonia. Over 1,000 kilometers north of Punta Arenas, the quaint little town of Coyhaique offer its own take on Patagonian beauty. Enclosed by cliffs, rolling hills and dotted with sparkling emerald lakes, fly fisherman congregate in this town known for its salmon and trout. Join in on the fishing fun, or embark on one of the other excursions to further explore the town. Sea kayaking through the Marble Cathedral and horseback riding and rafting trips along the Simpson River are popular activities. Good to know: Check out Feria Artesanal, a handicrafts market in Plaza de Armas, for authentic locally-made goods. You’ll find much of the merchandise is made from sheep, including sheep skin rugs and wool clothing. Argentina’s Lake District is arguably the most scenic in the country. Stretching along Argentine Patagonia’s northwest territory, this region sprawls thousands of square kilometers. It’s boxed in on three sides by the Andes Mountains, Chilean Patagonia and Atlantic Patagonia and coated with frosted mountain peaks, shimmering lakes, dense forests, trekking & biking trails and churning white water rapids. Clearly, there’s plenty of ways to spend your time here. Set up camp at Bariloche, the region’s bustling hub. The town itself will charm your socks off with its European architecture and scrumptious local cuisine. 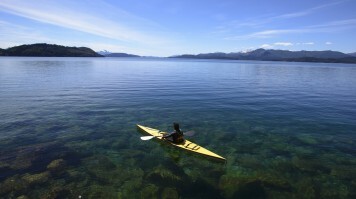 Visit Nahuel Huapi National Park — just 24km away — for days of kayaking, rafting, trekking, and mountain biking. One of the best ways to explore this region is by horseback. Guided day-tours lead riders all around the region and include a homemade lunch at a local estancia (ranch). Bariloche is considered one of Argentine Patagonia’s year-round destinations and if you come in winter, skiing and snowshoeing await at Cerro Cathedral. The place has many activities and attractions for the visitors. Good to know: Sample prime South American beer at the number of Bariloche’s microbreweries. Bariloche is also the country’s chocolate capital. Make sure to stop in to some of the town’s famous artisan shops and indulge in the country’s most exquisite treat. 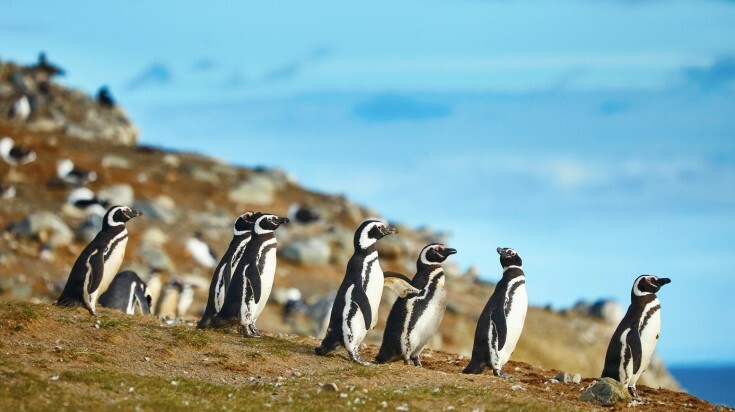 Animal lovers get their fix in Atlantic Patagonia, a refuge for endangered species such as orcas, elephant seals, sea lions, and Magellanic penguins. Peninsula Valdes is declared a protected UNESCO site and is home to a multitude of animals. Additionally, it’s also breathtaking beautiful with fine-powder beaches lined by soaring jagged cliffs. While there are plenty of wildlife viewing excursions to partake in around the peninsula, one of the top experiences is whale watching. As one of the most densely populated whale regions in the world, orcas and southern right whales can be seen from boats, kayaks, and even from the shore. Tours can be booked for the type of excursion you prefer. Good to know: If you want to see southern right whales, visit between June and December. If spotting orcas is your goal, March and April are your best bets. 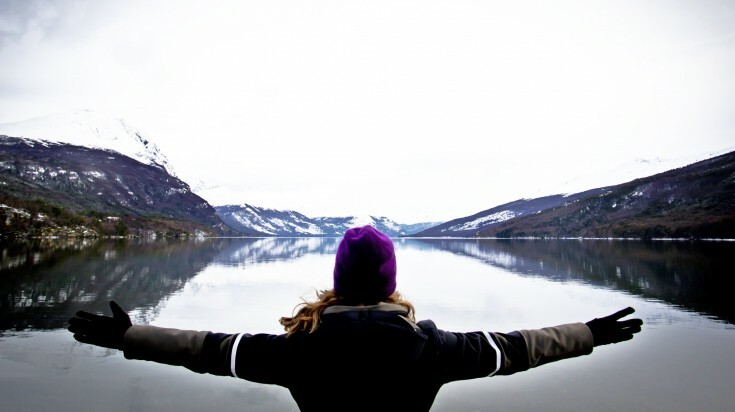 One of the most popular hubs from which to explore Southern Patagonia, El Calafate is a scenic town bordered by the Andes Mountains, the Santa Cruz Plateau, and Lake Argentino. Its picturesque position amongst the mountains and lakes make it an obvious choice for nature-loving travelers. Day trips from the town center including kayaking through the Upsala Glacier Zone to view the highest glacier in the country, spending the day experiencing life on a traditional estancia (ranch), exploring the Mars-like landscape of the La Leona Petrified Forest, or getting your exercise on with the many outdoor activities offered in Calafate Mountain Park. You could easily spend a week busying yourself on all the day-trips and excursions in and around El Calafate. Good to know: After long days of incredible adventure, what’s better than relaxing in the town’s one and only Glacier Bar? Visit GlacioBar and check out the area’s only bar sculpted entirely from the region’s glacier ice! 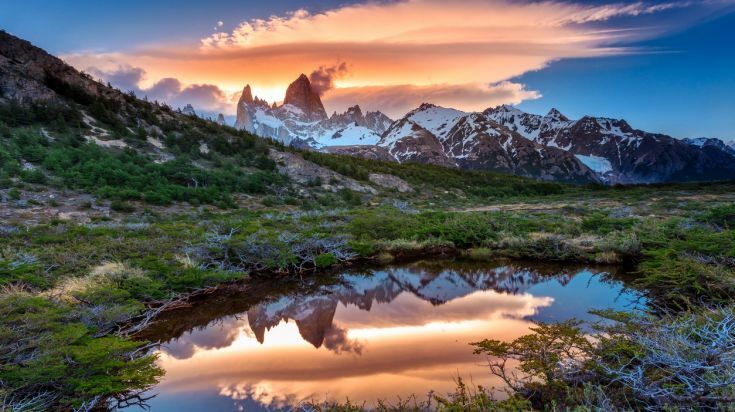 Renowned for its trekking and hiking routes, Mount Fitz Roy jagged peaks towers over the town of El Chalten. 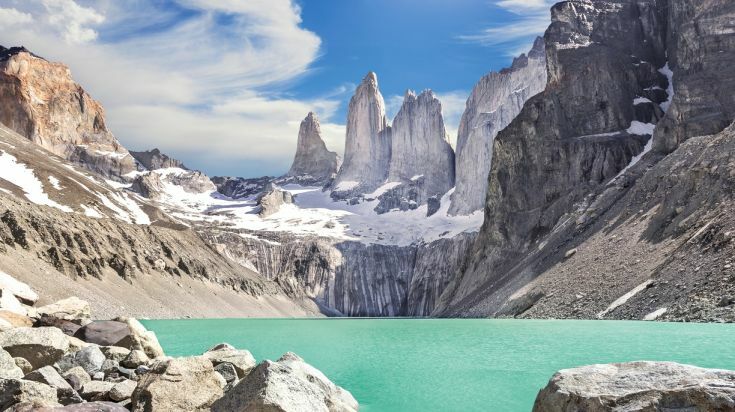 There are several worthy trails crisscrossing Mount Fitz Roy, but one of the most rewarding is the 1-day Laguna des los Tres. This trail leads past stunning blue glacier lakes all while presenting breathtaking views of Mount Fitz Roy. Although this trail can be challenging, it brings trekkers close to the mountain’s impressive peak — the highest in Glacier National Park. There are also lengthier two to three day’s treks which appeal to those who want to spend more time out in the wild. 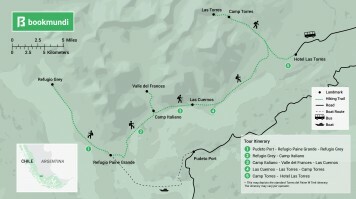 Good to know: Mount Fitz Roy is a common trip from El Calafate. El Chalten is roughly 3.5 hours north of El Calafate and is most easily reached by bus. There are three bus companies offering twice-daily trips between the two towns. 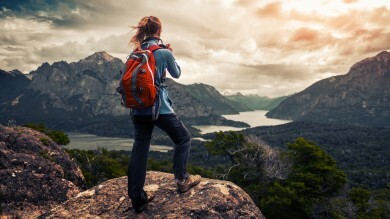 The most reputable companies are Caltur, Chalten Travel, and TAQSA. Most visitors spend the night in El Chalten after an exhilarating day on the mountain before heading back to El Calafate. Find out more about how to get from El Calafate to El Chalten. 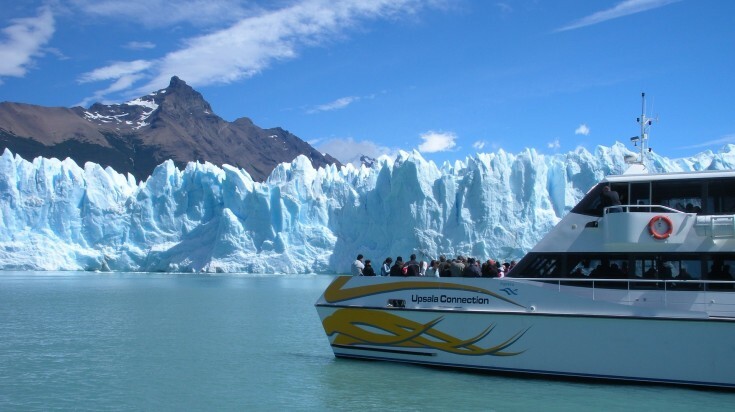 Leaving from El Calafate, a boat tour to view the massive Perito Moreno Glacier is the most popular thing to do in Patagonia. Sitting on the edge of Lago Argentino, this brilliant blue slab of ice is a staggering 70 meters thick and 30 kilometers long. Cruising up next to Perito Moreno instantly humbles visitors as they witness the true size of the glacier. Another unique aspect of the boat cruise is being able to hear the glacier as it shifts and cracks and watch as big chunks of ice break free and topple into the lake below. Good to know: If you don’t have time for the boat tour or it’s out of your budget, don’t worry. You can still experience this natural wonder. There’s a trail just inside the park that leads to ample viewing platforms where you can snap that perfect shot. Since this region’s beauty is split in two between Chile and Argentina, it’s worth it to experience the Argentine side of Tierra del Fuego, too. The most notable attractions here are Ushuaia and the Tierra del Fuego National Park. Ushuaia is the region’s capital and a gateway to Antarctica. The End of the World Train provides direct access from town to the park where all your wildest adventures await. Multiple 1-day treks entice travelers with abundant wildlife, dense forests, wild rivers, tumbling waterfall and access to some of the most untouched natural landscapes in the world. The panoramas over the Beagle Channel are a definite highlight. 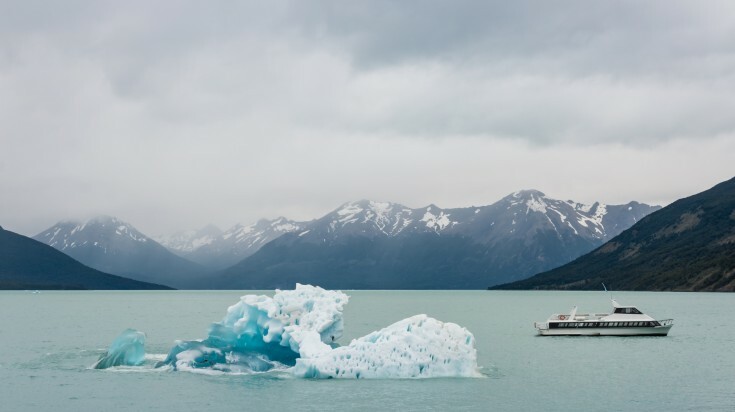 Good to know: You can fly into Tierra del Fuego from El Calafate but consider a boat trip as another mode of transportation that doubles as an excellent way to view the area. Multi-day boat cruises leave from Puntas Arenas (Chile) and meander along the infamous coast and into Argentina’s Ushuaia. This cruise, coupled with zodiac excursions, is one of the best ways to see the region as much of the spectacular sights are the fjords, glaciers, and wildlife that hang around the coastal areas. Another option is the 24-hour ferry from Puntas Arenas to Puerto Williams (Ushuaia) which still allows you to see much of the stunning coastline. 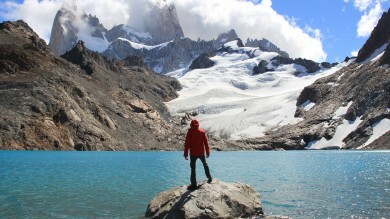 Patagonia’s attractions interest different types of travelers from all over the world. Rich in culture, filled to the brim with stunning natural scenery and with plenty of ways to explore it all, the things to do in Patagonia leaves no one disappointed. *Note: Prices are as of December 2018.